Seasonality is now more important than ever for foodies and home cooks and this new book is both an exhaustive recipe resource and an authoritative produce guide. 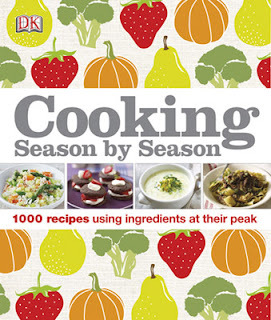 With 1000 recipes organized by season, and "Season's Best" features highlighting which produce tastes amazing right now and how to make the most of it, Cooking Season by Season is an essential resource for being in touch with the flavors of the season. When I saw this book, I knew I had to get it. I love knowing what foods are in season and best to be consumed. With my love for cooking, I was eager, and chose two recipes. First main course. Of course. I don't eat vegetarian often. I'm a meat chick. Well, you should know that by my Beef Ambassadorship.... anyways, I enjoyed this dish. The beans filled me up the way meat does, and the best part is, being a diabetic beans are really good for me. (They're high in fiber.) Plus, I'm a bit of a zucchini-virgin... I mean, I've had it, but never really cooked it before... so didn't know what to expect. Was really friggin' good! So now onto the second dish I tackled. Dessert. I can't have tons of sugar and this only had a couple teaspoons in the whole thing. It was sweetened naturally with the fruit and ice cream. It was so good! It hit the spot after that main dish. And it's also one I think I will make again and again. I look forward to cooking some more out of this book. I definitely look forward to checking out each season as it comes, and mark my words, I will be cooking seasonally from it! Love the front of the book, COLOURS! A dessert with only a few teaspoons of sugar is one I can have. It looks delicious! Great idea for a cook book. Now my mouth is watering.